Hey guys! It's been awhile since I've popped in to say hello! Have you lost weight? You look fabulous! I read Ashlen's post about her caucus experience and couldn't resist the opportunity to share mine! If you're here for a political debate or to tell me how wrong I am for supporting my candidate, please skip leaving any comments and lets assume we couldn't change each other's minds and eventually agreed to disagree, okay? Awesome! This is also one of the first unofficial polls in the country; fair-goers are encouraged to drop a kernel of corn in the jar for their favorite candidate. Sure, even the kids vote in this poll, and they don't check for voter registration; it's a pretty neat way to gauge interest in a candidate. But enough about August's State Fair. Our chilly caucus night seemed about a lifetime away from the summer heat, and the candidates were a much smaller group than the August polls. But this story actually starts in June, BEFORE the state fair, when my husband and I went to hear Vermont Senator Bernie Sanders speak at Drake University. I was iffy when he first suggested going, but was glad I tagged along. I liked what Mr. Sanders had to say, and signed up for more information. Over the next six months, we donated time, money, purchased shirts and bumper stickers, and welcomed into our home six different volunteers that traveled to Des Moines to volunteer for his campaign. I would say this was a pretty big deal in our house as both my husband and I have been registered Republicans since the age of 18. In fact, I was elected my previous precinct's caucus chair in 2012, running that year's caucus. The Republicans caucus by secret ballot, while the Democrats have their own style. When our local adult contemporary station (star1025.com) asked for Caucus Correspondents to share their story, I was eager to share mine. 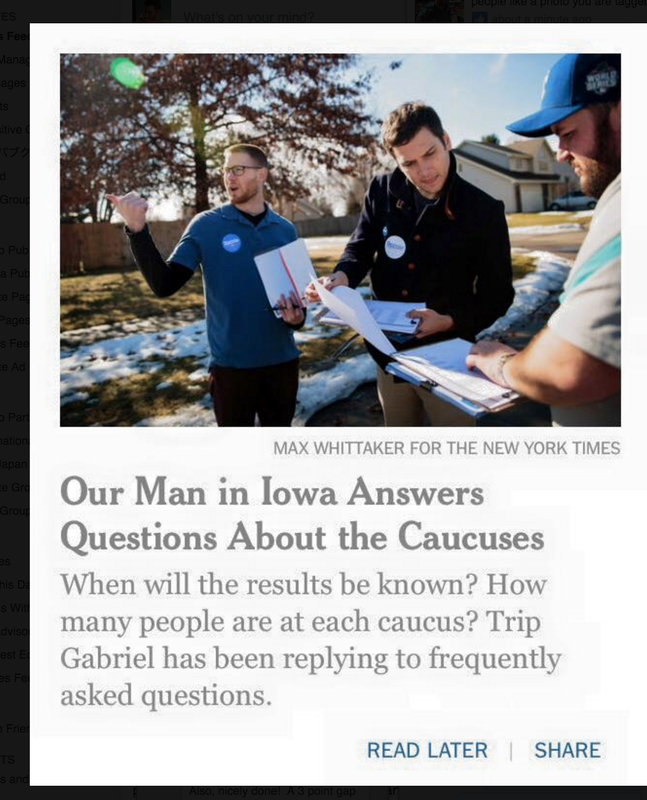 The weekend before the caucus, I called and left a message auditioning to be a correspondent and was thrilled when friends reported hearing my voice Monday morning! Monday night we ate a quick dinner before walking the quarter mile to our caucus location. Joining us was one of our guests who traveled via Greyhound bus from Dallas to volunteer for the weekend. Of course, he couldn't participate, but was thrilled to observe the process as Texas is a Primary state. We arrived to a packed church hall; 266 voters, 2 observers, and 3 photographers in a space that comfortably holds 75. After that first head count, it was time to caucus! I mentioned Democrats caucus differently than Republicans. Typically, the room has a 'zone' for each candidate, plus one for 'undecided' folks. But the number of people we had just made that impractical, so they sent Senator Bernie Sander's supporters to the chapel, and the Clinton, O'Malley, and Undecideds stayed in church hall. After all the Bernie supporters got to the chapel, it was time for the 2nd head count. A candidate (even the "undecided") must have at least 15% of the people to be considered viable. In our precinct that was 40 people. Bernie got 150 of the 266 votes in the 2nd head count. With only 15 people between Martin O'Malley and undecided, we sent about a dozen people to help sway those voters to the Sanders' group. I sat next to a kid wearing a sweatshirt from Ashlen & I's alma matter and found out he attends parochial school nearby. His mom commented that he was bored, and I explained how cool it is that Iowa gets all this attention. We don't have a ton of electoral votes, but we are a swing state. Holding the first in the nation caucus is huge and puts the spotlight on us. I explained that in no other state were people doing this tonight, and it made us a big deal. Ashlen mentioned bringing Max next time - what a great social studies and government lesson for your kiddos! The Precinct Captain (a volunteer who has been trained by the campaign) told us it would be about thirty minutes, so I googled "Bernie Sanders Trivia" and got up in front of everyone and lead the group playing trivia. I was caught off guard when I saw a family friend whom I really love, respect, and admire in the church as a Bernie supporter. It made my heart fill up with happiness and I almost cried. No joke. So here I am, asking Bernie trivia questions when the voters returned with 3 new voters, giving the final tally of 153 Bernie and 113 Clinton, this means of our precinct's 8 delegates, Sanders got 5, and Clinton got 3. And I volunteered to be a delegate to represent my precinct at the county convention next month. We walked back home and headed to the airport Holiday Inn for the results rally. It was so cool to be a part of something bigger than ourselves. We've been open with my bonus daughter about our support of Bernie, why we support him, why we host volunteers. But it dawned on me that she gets tons of opportunities to be a part of something bigger than herself; high school pep rallies, speech and debate team, colorguard, etc. But as adults we have fewer and fewer of those opportunities and we have to seek them out in churches and sports team, and for us, Bernie Sanders. Videos like this one have given me goosebumps and, yes, even a few tears. Make fun all you want; just keeping it real. So when they played the same video at the rally before Senator Sanders arrived, of course I shed a few tears. This cute guy was my Caucus date! We watched the projectors sharing live feeds from NBC; with every update we saw Sanders gaining more votes and delegates. As a couple reporters later noted, there were a large 'booo!' when Hilary referred to herself as a progressive during her 'victory' speech. (How could it be a victory speech with only 83% of precincts reporting and 0.3% difference between the two?) And there was a HUGE cheer when the feed froze as she spoke. There were reporters everywhere at the rally; Iowa Public Radio and Der Spiegel (one of the largest news outlets from Germany) interviewed us. On Wednesday, our last two house guests left after a quick stop at campaign hot spot, The Waveland Cafe in Des Moines. 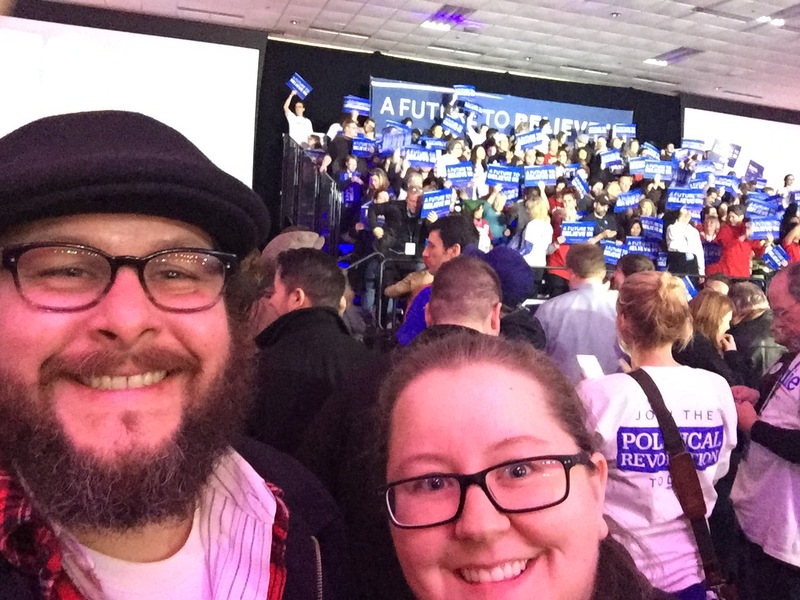 We were so excited to be part of Bernie's campaign in Des Moines, and eager to see how he does throughout our country. If you'd like to learn more about Bernie or find out the specific reasons he's earned our support, feel free to drop me a line lauren@thekidsperts.com. If you want to try to change my mind, save yourself the trouble and delete your own email before you hit send. If you want to send mean/accusatory/hurtful things regarding my candidate choice, know that I'll totally post screenshots online and make fun of you. Sound good?